Pigs and humans share a surprising number of attributes. Both species are by nature social creatures choosing to live in groups for comfort and mutual safety. Both form friendships and relationships with those around them, including members of other species. Like human mothers, sows nurture their young with milk, warmth and love while protecting them from danger. 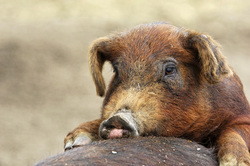 Piglets, like children, enjoy playing with toys and one another – wrestling, rolling down hills, running and leaping. Pigs prefer a diverse diet, and are even similar in size and weight to adult humans. Their pink, mostly exposed skin resembles human flesh more than most animals’, and, like us, they dream and see colors. Pigs also have perhaps the most complex set of domestic animal vocal sounds: researchers have identified more than 20 distinct categories that include greeting, distress, separation, excitement, aggression, fear, pain and so forth. Studies show that pigs are intelligent, and researchers have even taught some to play video games. Donald Broom, Ph.D., Professor of Animal Welfare at Cambridge University’s Veterinary School, claims that pigs’ cognitive capacity is similar to that of a three-year-old human child. More and more American families are keeping pigs as pets, and many animal experts believe they are easier to train than dogs. Everyday observations strongly suggest that each pig, like every person, has a unique personality and a distinct self. Still, Americans eat over 100 million pigs every year, and many seem unconcerned that sentient animals are killed under the most inhumane conditions to make the ham, pork chops, bacon, sausages and baloney they buy in supermarkets. Worse yet, many if not most may not even be aware that over 90% of pigs come from factory farms that produce meat more cheaply by raising and processing animals in assembly-line fashion. Yet if pigs experience emotions and feelings akin to those of humans, and if each pig is an individual, don’t we have some ethical duty toward them? Given that it is not even necessary for humans to eat pigs (or any other animal for that matter), aren’t we obliged to at least consider what they might want, given a choice? Compared to the vast majority of factory pig farms, Wild Outback Ranch is a virtual pastoral paradise. Farmer Brown’s herd of 60 or so pigs shares 440 acres of pasture with dozens of other animals, including cows, horses, goats, chickens, sheep and a donkey. Their environment is one that allows nature to provide for basic needs: mud ponds to cool off in, shady trees, and dirt in which to forage for plants and insects. The pigs eat a healthy diet of corn and cereal grains, alfalfa, fruits, vegetables and cow’s milk. They enjoy sleeping together on earth and straw in a large roofed burrow at night, and doze in small groups throughout the day. New mothers are free to build smaller nests for their newborn piglets in separate shelters, and then return to the group a few weeks later with babies in tow. This arrangement allows the piglets to learn first from their mothers and then later from other herd members how to be pigs. Pigs in factory farms live in an entirely different world. Rather than a few dozen hogs living mostly outdoors, a factory farm may cram up to 12,000 pigs together in a single enclosed building the size of a football field. There are no straw nests or mud puddles here – only hard concrete and cold metal for pigs to stand and lie on, often in their own excrement. This is especially degrading to pigs because, despite contrary notions, they are by nature very clean animals who never soil their eating or sleeping areas when given a choice. The process starts with the breeding sows, who, rather than being allowed to build nests during pregnancy and nursing, are confined in gestation crates that are so narrow they can’t even turn around in them. No exercise or nesting is possible, even though the urge for such behavior is strong. When born, rather than enjoying the warmth and security of their mother’s body, piglets are only allowed to take milk from their mother through the steel bars of yet another restrictive cage known as a farrowing stall. Three to four weeks after the piglets are born, they are taken from their mothers and shipped to a “finishing” facility where they are fed a high-protein diet spiked with hormones to accelerate their growth so they can be slaughtered at just six months of age. Until that time, they receive antibiotics that will keep them well enough to live out their short lives in their filthy and unhygienic surroundings. As intelligent creatures, pigs raised in crowded, artificial conditions naturally get bored and stressed, and typically take their frustrations out on each other. Therefore, to prevent the pigs from biting one another’s tails off (thus increasing the risk of blood infection), it is standard practice on factory farms to dock their tails and clip their teeth, all without anesthesia. Having provided a natural environment conducive to their inherent natural tendencies, Brown has no need to mutilate his animals (though he does castrate most of the males to control breeding). Growing up on his family’s farm in Tualatin, Oregon, Brown learned to respect the complexity of pig society; he understands that each pig is an individual whose feelings matter. As a species, pigs have unique ways of expressing their likes and dislikes. They grunt when they are happy, and even wag their tails like dogs when excited. Pigs also enjoy hanging out with people and being petted. They are very tactile animals who love physical contact, especially belly rubs. The pigs like to be around Brown while he works the farm. He enjoys their company in turn, and gives names to his favorites. Farmer Brown sees himself as part of a long sustainable stewardship tradition going back at least 10,000 years to the beginning of the agricultural revolution, when humans first began domesticating animals for food. He even encourages conscientious omnivores to visit Wild Outback Ranch “to see where their meat comes from and make a connection with the animals, see what kind of life they have here.” You’d be hard pressed to find any factory farm offering a similar invitation. If you are concerned about animal welfare but don’t feel quite ready to make the leap to vegetarianism, there are still actions you can take to help animals. For example, you can choose to eat less meat, and you can support farms that raise free-range animals. For more information about Wild Outback Ranch, contact Brian Brown at (541) 788-6194 or wildoutbackranch@hotmail.com.